Actual rate of return received by investors or the actual interest rate paid by borrowers. The Effective Annual Rate (EAR) is the rate of interestInterest ExpenseInterest expense arises out of a company that finances through debt or capital leases. Interest is found in the income statement, but can also be calculated through the debt schedule. The schedule should outline all the major pieces of debt a company has on its balance sheet, and calculate interest by multiplying the actually earned on an investment or paid on a loan as a result of compounding the interest over a given period of time. It is usually higher than the nominal rate and is used to compare different financial products that calculate annual interest with different compounding periods – weekly, monthly, yearly, etc. Increasing the number of compounding periods makes the effective annual interest rate increase as time goes by. What is the Formula for the Effective Annual Rate? Union Bank offers a nominal interest rate of 12% on its certificate of deposit to Mr. Obama, a bank client. The client initially invested $1,000 and agreed to have the interest compounded monthly for one full year. As a result of compounding, the effective interest rate is 12.683%, in which the money grew by $126.83 for one year, even though the interest is offered at only 12%. 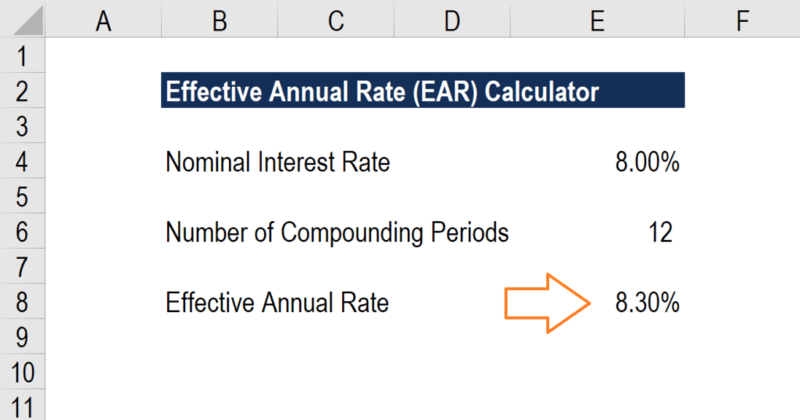 Below is a screenshot of CFI’s free effective annual rate (EAR) calculator. As you can see in the example above, a nominal interest rate of 8.0% with 12 compounding periods per year equates to an effective annual percentage rate (EAPR) of 8.3%. A nominal interest rate is a stated rate indicated by a financial instrument that is issued by a lender or guarantor. This rate is the basis for computation to derive the interest amount resulting from compounding the principal plus interest over a period of time. In essence, this is the actual monetary price that borrowers pay to lenders or that investors receive from issuers. What is a Compounding Period? A compounding period is time period after which the outstanding loan or investment’s interest is added to the principal amount of said loan or investment. The period can be daily, weekly, monthly, quarterly, or semi-annually, depending on the terms agreed upon by the parties involved. As the number of compounding periods increases so does the amount of interest earned or paid on the money used. Quarterly compounding produces higher returns than semi-annual compounding, while monthly compounding generates more than quarterly, and daily compounding generates more than monthly. To learn more about interest rates, check out CFI’s free online finance and accounting courses! How Important is the Effective Annual Rate in Business? The effectual annual interest rate is a useful way of evaluating the actual return on investment and ascertaining the interest expense paid on a loan. Borrowers need to have a solid understanding of the impact cost of debtCost of DebtThe cost of debt is the return that a company provides to its debtholders and creditors. Cost of debt is used in WACC calculations for valuation analysis. Learn the formula and methods to calculate cost of debt for a company based on yield to maturity, tax rates, credit ratings, interest rates, coupons, and has on their business, as it will impact their profitability and solvency. A higher interest expense lowers the interest coverage ratioCoverage RatioA Coverage Ratio is used to measure a company’s ability to pay its financial obligations. A higher ratio indicates a greater ability of the company to meet its financial obligations while a lower ratio indicates a lesser ability. Learn Interest Coverage, Debt Service, Cash Coverage, and Asset Coverage ratios, examples for a company, which could reduce its ability to service debt in the future. Additionally, the higher interest expense will lower net income and profitability for the company (all else being equal). On the flip side, investors will benefit if the effective interest rate is greater than the nominal rate offered by the issuer. They also use this rate to compare various investment portfolios by using different compounding periods to make an effective decision.